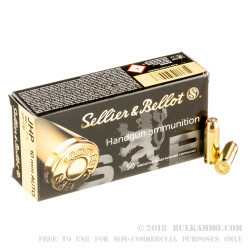 Break in your new 10mm Hi-Point Carbine or Sprinfield 1911 TRP with this excellent defensive ammunition from S&B (Sellier & Bellot). 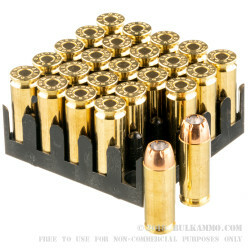 This ammunition is made in accordance with modern standards using the finest components. These include brass casings that have been checked over to preclude burrs and imperfections for positive feediing and extraction. 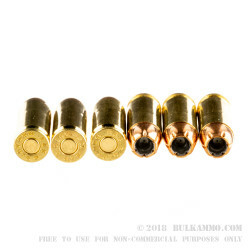 The brass casings can be deprimed, cleaned, reformed, and reloaded after firing. Each case wears a non-caustic Boxer primer at its base for superb ignition with each trigger pull; the primers are free of corrosive materials so you don't have to worry about wearing out your chamber or breech face. 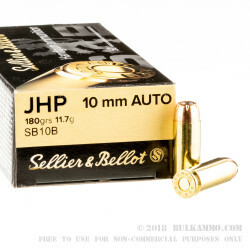 Atop each load is a JHP (jacketed hollow point) projectile which weighs in at 180 grains, a median choice for the 10mm Auto caliber that offers a nice balance between terminal energy and manageable recoil. The JHP's wide-mouth cavity allows it to expand rapidly while traveling into a target. This helps cut down on the risk for lethal overpenetration which could potentially cause collateral damage to bystanders. In addition, the expanding bullet will deliver incredible energy to the vital organs of a threat or game animal in order to bring them down quickly and cleanly. Q: Do you have ballistics on this bullet? Q: What is the muzzle velocity for these rounds?